Another photo with a Cos player. The fun and excitement did not end there as we were still able to watch a program participated by those talented Thai students. The show is free and I guess that it's a part of the weekend activities of this Thai group of teenagers. Costume players are always in these days. There's always COsplay events at SM and seeing them live indeed brings a lot of excitement especially for teenagers. Obvious naman na natuwa ang 2 mong anak, Krizz. An experience worth remembering. I really want to see people in Cosplay and take pictures of them... but I haven't been given the chance! You are so lucky! those were really cute. 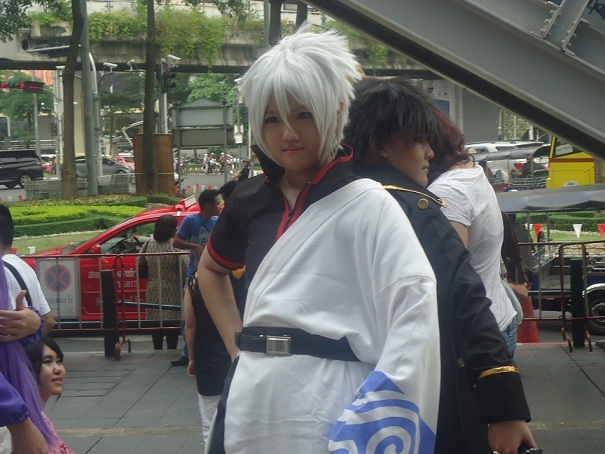 I which I got a chance to witness cosplay too. I don't know why but I have fears with their eyes especially the human dolls. But they are so cute naman. I wish someone wore the costume in Maidsama. I'd love my kids to encounter a cosplay when they're older. They're still at the age where they enjoy mascots. Cosplays are also held here in Philippines. Unfortunately I haven't witnessed any personally. I only see the players on photos when some friends posted them. 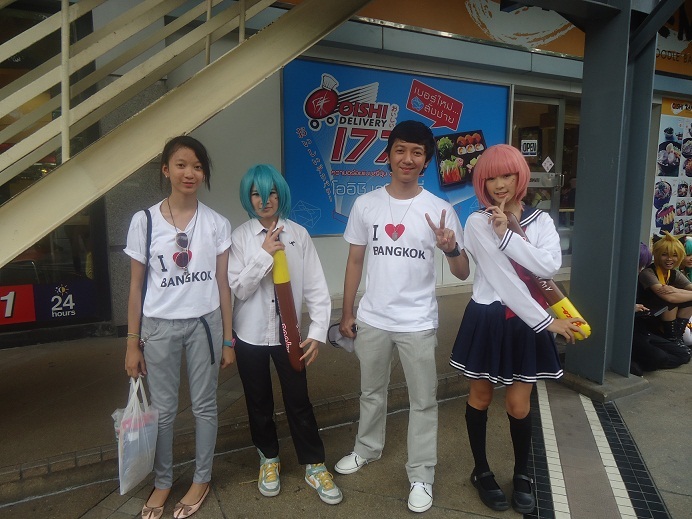 ohh.. that is in deed a cool experience.. you're right the thai teenage on the first photo is really cute, she looks like a doll..
We have cosplay people here also, although I have not seen one in person yet. They make a big hype on cosplay but from an objective view, I think it is not much different from Disney parades or other parades where people wear costumes to look like someone or something. Anyway, I think it's an event that is a feast for the eyes, what with all the colors. You don't get to see pink haired girls everyday hehehe. aha! cosplay is costume play pala. and yun pala ang tawag sa mga ganun. they look so cute but just like reese, its not my thing. i cant pull that look off hehe. I'd love to see a cosplay, it's so fascinating. My husband loves Anime, so I don't need to drag him to the event! He will also love it for sure. I'm not into cosplay pero nice to look at the creative costumes talaga. Our company party starting in an hour has an anime cosplay theme. your kids are happy to have witness the cosplay and the program in the mall for free..
im not into cosplay either but i think their make ups and costumes looks soo interesting...and cute if i may add. Cosplaying is the in thing for TEENS this days. You can see them wearing their cosplaying outfits with or without event. Love anime very much and mostly cosplayers get their character from it. I would love to do one cosplay but not yet sure when will I be able to do that. hahaha. 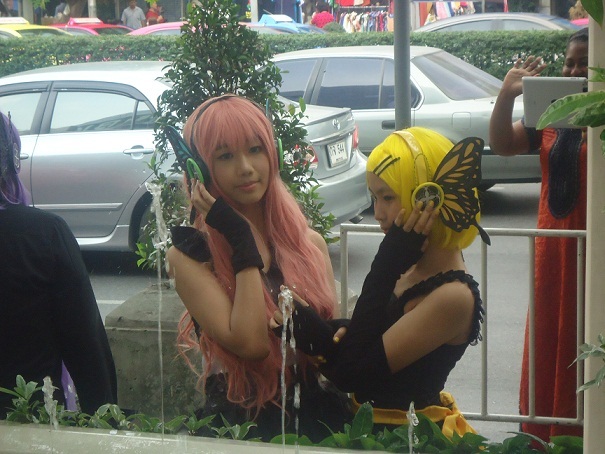 Cosplay seems to be popular for anime lovers here in the Philippines. It's fun for the kids and photographers. I've witnessed this too at Trinoma and my family and I were really amused and entertained at how meticulous the participants were with their creative costumes. Those teenagers look like they stepped out from an Anime movie. Haha. So cute! It seemed like a very nice experience for you...I am scared of people who do/dress cosplay. I dunno. These teenagers are really cute; I love their costumes and hair styles. I especially love the first picture. She is so cute like a doll.